a rocker, "work it out"
Discussion in 'Artist Spotlight' started by batsbrew, Mar 22, 2019. Tone_Terrific, evanjackson and RGB like this. Sounds good man. Love that Ibanez Artist! I have had a few of those over the years. Excellent guitars. Is that you singing? At 2:20 or so reminds me of a Frank Marino lick he does in some songs. love frank, saw him live in the jacksonville fla civic auditorium, back in the day, he just slayed it! slight more mid range biting - doesn't sound like an Ibanez. Where did you record the song? Are the drums programed and sampled? One critique - it sounds like you mixed this while listening to the tracks loud. There is a density to the track where everything is fighting for sonic space. that's where the mix lives. 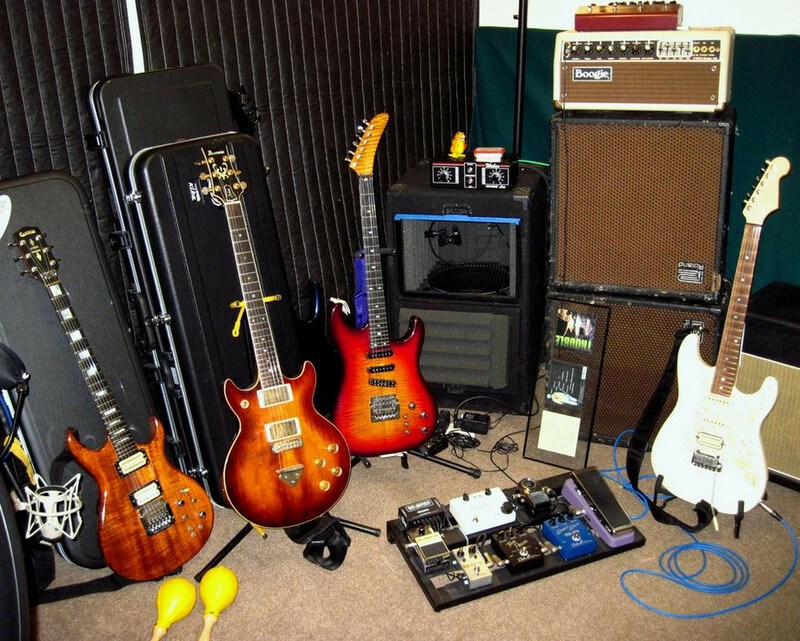 the guitars used on the rhythm riff, were a custom usacg strat and the ibanez. 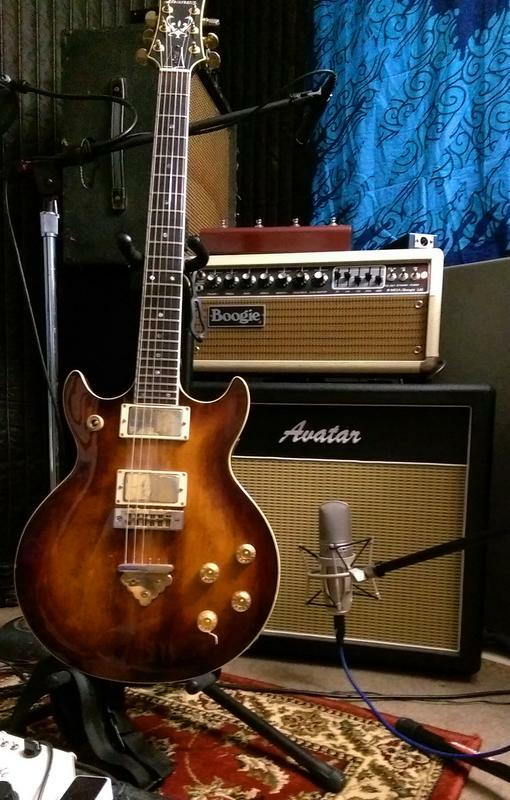 the solo is the carvin dc200K, which is solid koa. played and recorded by a pro drummer in the dallas/ft worth area. What was the signal chain? Did you record at a home studio? sound like a Modeler. Inquiring minds want to know! LOL! '82 mesa mkIIb 60 watt head, usually close miced, at volume. 4 different cabs, demeter silent speaker cab, avatar vintage 1x12, and 2 roland 1x12's with different celestions. chain is 57 or shure ksm44 into A Designs Audio MP-1 mic pre, into a RME babyface pro, into DAW. some of the tracks are captured using a Palmer PDI-09 right off the output of the mesa. the solo was recorded thru the closed back roland 1x12 with a celestion g12C-30 and the 57.
very basic, very straightforward, delay was from the effects unit in the loop of the boogie, and a dash of eq on the mix. I really liked it. I don't say that much with original material, to be sure. If ya want feedback on it: here goes. Love the initisll gtr solo tone. GREAT. The phrases threw me, but thats ok. In fact the opening bewildered me. Maybe thats what you wanted. Once the whole band came in, I had the A-Ha moment. VERY,VERY GOOD STUFF. I like the mix, it owes apologies to noone,imho. Sure one could compress the be-geez out of it....but then it would be made tame...and hey, its a rock song, ok? The vocal was really good. A great voice for aggressive material. Unique, pleasing,skilled. You really have something there. Dont forget that. Congrats, great stuff. yea, i wanted a curve ball on the beginning of this one. makes coming out of the gate at 1:02 more intense! That was great! Loved it! Checking your other stuff now. Here's my music if you get a chance. i've got 3 full length albums for sale on cdbaby, itunes,etc, so there a LOT more where that came from. thanks so much evan! appreciate it!